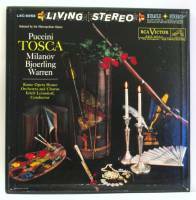 Tosca (1900) was arguably Puccini's first foray into verismo, the realistic depiction of many facets of real life including violence. The opera is generally considered of major importance in the history of opera because of its many significant features. **** La Tosca is a five-act dramatic play by Victorien Sardou, first produced in Paris in 1887, with Sarah Bernhardt in the title role. The New York revival with Bernhardt in 1900 was also well received. The play is set in Rome in mid-June 1800, against the background of the historical events then occurring (see ref 1 & 2, and Battle of Marengo (1800). As in the opera, the principal characters are Floria Tosca, a singer Mario Cavaradossi, her lover, an artist Baron Scarpia, the head of the Secret Police Sardou's text was the basis of the opera Tosca (1900) by Giacomo Puccini. Verdi had earlier expressed a desire to set the text, but only if the ending were changed. Puccini initially also attempted to get Sardou to amend the 'abrupt' final scene, but without success. Wikipedia ** Tosca is firmly affixed to a moment of history and thus cannot be staged in another time setting without an outrage being committed. It is equally nailed to specific local in each of its three Acts, all of which still exist. The Castle San Angelo (Act III) is even today a particularly dominant feature of Rome. Benvenuto Cellini's engrossing account of his escape from being imprisoned there some roughly two hundred years prior to the misadventures of Tosca and Mario at the same site, yet resonates. The Opera requires three powerful vocal actors and is a favorite vehicle for such. A surviving video clip of Maria Callas at the climactic moment is riviting and decisively demonstrates that top Opera performers must possess talents beyond the vocal. The dramatic plot is tight and perfect. Every word of the text is highly significant. R.E.C.